Learn more about account user roles and how to manage them. Customers who purchase 100,000 or more credits unlock multi-user support, which allows them to add multiple users of varying roles to the account. This feature is intended for enterprise accounts, where multiple users may need to oversee your flows, campaigns, scheduled broadcasts and contacts, or routinely export information from the account. To add additional users to your account, first navigate to your account's home page. Scroll to the bottom and click the 'User Accounts..." icon. Here, you can choose to manage account users via the 'Manage Accounts' button or, if you're using a Surveyor app to collect information offline in the field, create a password that other Surveyor users can enter into the app to be able to submit responses to your account. Click the 'Manage Accounts' button. The 'Manage User Accounts' page is where you'll add, edit and remove additional users of various roles. To add a users, simply enter their email address and select the permission you'd like to give them. Surveyors have no administrative privileges, nor can they access the account. They may only submit flow results via our offline flow-based data collection mobile Nyaruka Surveyor apps. Viewers can see every aspect of the account, but may not modify anything. This means that they cannot edit any aspect of the account, such as flows or contacts, nor send messages. 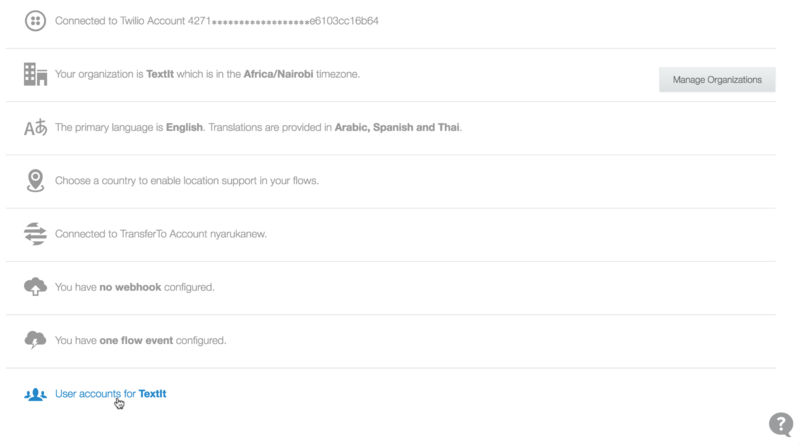 Editors can edit flows, campaigns, triggers and contacts; send messages; start flows; export flows, contacts and messages; and export/import flows. Editors cannot make changes to the account's home page, including managing account roles, changing language or timezone settings, and adding and removing channels. In addition to editing privileges, admins may make the above-mentioned changes to the account's home page.